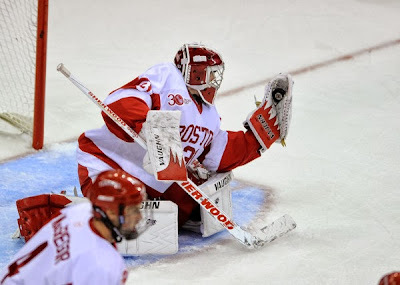 A three-goal second-period outburst helped BU shake off a tight opening period and provided all the offense needed in a 3-1 win over UMass that kicked off the Head Coaching career of David Quinn. Sophomore goalie Sean Maguire stopped 39 shots and carried a shutout through nearly 51 minutes before Steven Iacobellis’ power play goal put the Minutemen on the board. Just a minute into the middle stanza, co-captain Garrett Noonan took a slick pass from Ahti Oksanen and wristed a shot past the UMass goal who was screened by Robbie Baillargeon. Four minutes later with the Terriers having a man advantage, freshman Tommy Kelley ripped a Cason Hohmann centering pass under the cross bar with Oksanen also picking up an assist. Evan Rodriguez upped the lead to 3-0 as he neatly toe-dragged past a defenseman and then roofed the puck with Oksanen registering his third helper. Retired head coach Jack Parker was at the game with his grandchildren and drew a roar from the crowd when they were captured on the video scoreboard. Parker also was interviewed between the first and second period on the NBC Sports Radio broadcast and revealed he’ll be doing a bit of coaching next month. Along with two of his former assistants, Ben Smith and Mike Bavis, Parker will direct Team USA in the Deutschland Cup in Munich. Team USA will feature Americans playing professional hockey in Europe. Terriers dressed seven freshman for their opening game. Terriers are back on the Agganis Arena ice tonight at 7 p.m. to meet Holy Cross. With no other conference games on the Hockey East composite schedule until Nov. 1, BU will hold first place for the next few weeks. 2014 JJ Piccinich scored his seventh goal in seven games this season as Youngstown blanked Chicago, 3-0. The 6-0 right wing’s 7-3-10 line is second in USHL goal-scoring and points. Adam Clendening’s second goal in three games helped AHL Rockford defeat Lake Erie, 5-2. Where are they now: Clark Donatelli, the leading goal-scorer (28) and a teammate of Quinn on the 1985-86 squad that won BU’s first Hockey East tournament championship , is now in his second full season as head coach of the ECHL Wheeling Nailers. The Nailer lost a preseason game 2-1 to Reading with former Terrier Sahir Gill scoring a second-period goal for Wheeling. That tally was matched 30 seconds later by the Royals’ Ryan Santana. Terriers skated to a 2-2 tie with Rensselaer to open their season last night. BU, which received goals from sophomores Jordan Juron and Rebecca Russo, carried a 2-1 lead into the third period, but the Engineers tied the score and the teams played a scoreless overtime.